A father sends his petulant and unpredictable son off to live in an institution, but not before grabbing enough of his DNA to have a clone made. Son #2 turns out to be everything he ever wanted, the good son, until the father's world begins to unravel when the hospital who executed the science comes clean with the fact that they made more than one copy, 10 possibly 20, maybe more. The second son encounters the first, figures out what is going on, and the father's head and heart spins in a vortex of guilt, denial, bargaining, and finally, acceptance. 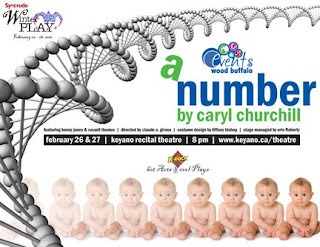 This is A Number, a one act play written by Caryl Churchill. Kenny (Jones) and I are five or six rehearsals into the process of getting the show ready for WinterPLAY, being directed by Claude Giroux. We did our first show together in 2008 when we tackled Lone Star by James McLure. Last year, we ascended the mountainous play written by the acclaimed Edward Albee, The Zoo Story. Each time we begin to settle into the story there are delightful discoveries, moments of sheer panic -- fearing the raft of lines we need to learn in a short amount of time, and a tangible sense of escapism as we create this make-believe world envisioned by the author. Every actor has a different routine for learning their lines. Kenny needs to work with someone, bouncing lines back and forth. Others physically write out the words, cementing them into their memory. Claude sits on the floor and bounces a ball off the wall -- the theory being if you can memorize your lines while doing a fine motor activity, they will be more easily retrievable when on stage. (Hugh Laurie does the same thing on House as he goes through the differential diagnosis process) Me, I find my quiet place, either the bathtub or my study, and absorb the play line by line, page by page, section by section. In the end, we will become our characters and step onto the stage and into the story. You'll be able to see the results on February 26 and 27 in the Keyano Recital Theatre as part of KROCK's Hot Acts & Cool Plays during the WinterPLAY Festival. Kenny, Erin (Stage Manager), Claude, Tiffany (Costume Designer) and I invite the readers of Middle Age Bulge to join us. Tickets will be available soon at Keyano Box Office. I'm about 196 pound today. The show is in four weeks. If I continue discarding mass at the current rate, I could be in the territory of 185 pounds. It's only A Number, but it'll be a great achievement.